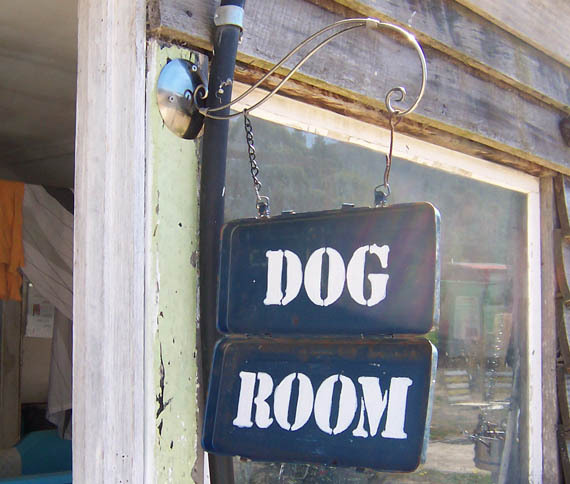 I have a new ‘Dog Room’ sign! When I’m grooming dogs I find that people who’ve never been to our place before will wander around the yard aimlessly, not knowing where to go. 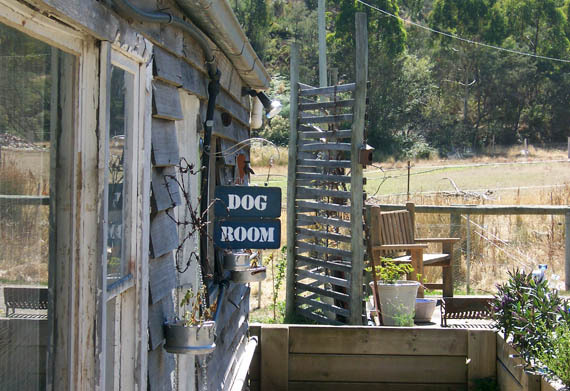 I used to have the blackboard on the front porch with instructions: ‘Dog grooming in the shed behind you’, but since I started painting the house the chalkboard has been moved. I thought it was time I did what I’d always planned and put some signs up to direct people to the right place. The first thing I did was consider what I had on hand which would I could use to make a sign. I had plenty of timber, but I also had this cute little wire thing I’d found at a tip shop which I thought would make a great wall hanging sign holder. I have no idea what this thing was used for originally, unless it was to hang bananas on… I drilled holes in it and voila! A bracket to hang a sign off! 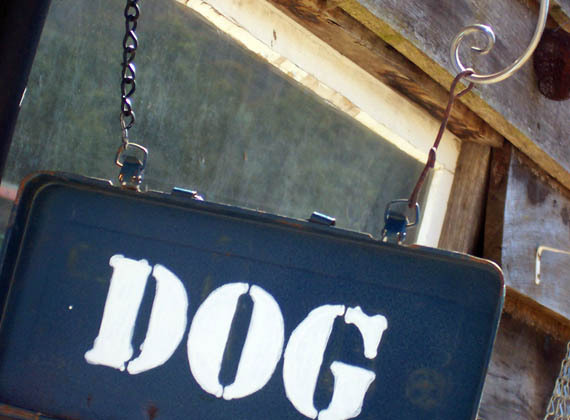 I also have quite a few of these old metal tool boxes. The smallest one I had was a perfect fit for the hangy bit thingy. 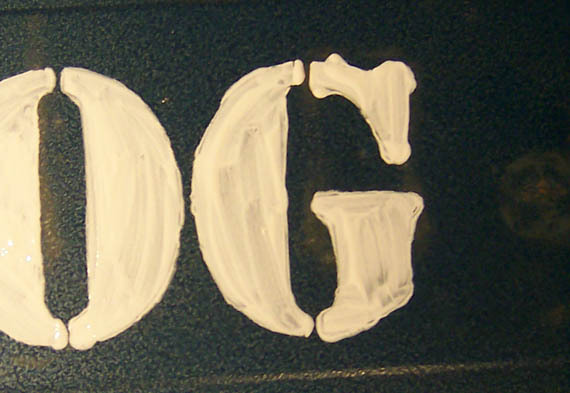 So… since I was already painting the house and had the undercoat enamel tin opened, I used some of that paint to paint the letters on the metal box. 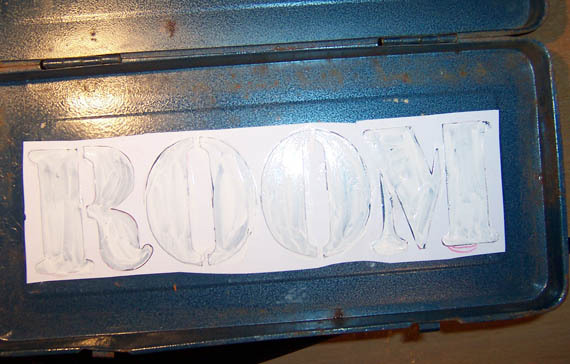 I had made myself a stencil (for a sign I’ll share tomorrow) so I simply re-used it to do this sign. For this sign I decided to shortcut the process. Instead of drawing the letters and then painstakingly painting each letter by hand as I did with the other sign (the neat one), I just painted over the paper carefully as you would a proper stencil. Given I was using a paper stencil I’d cut myself and not a proper one, I had a bit of ‘leakage’ under the stencil. Not to worry. 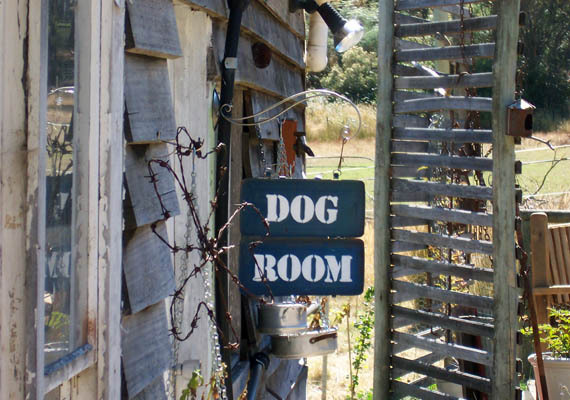 I wanted this sign to look a bit rustic. 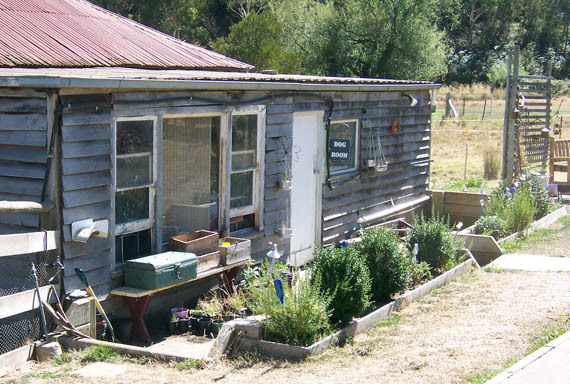 After all, its going on the side of a very rustic old house-come-shed-come-grooming-room/workshop/feed storage/laundry and whatever else we need it for. Of course I had to hang the sign on the bracket. I only had one piece of chain I could pry open to attach on both ends. All my other chains are too heavy and too impossible for this job. So I improvised. I got some rusty old wire and made myself a hook for the other side. 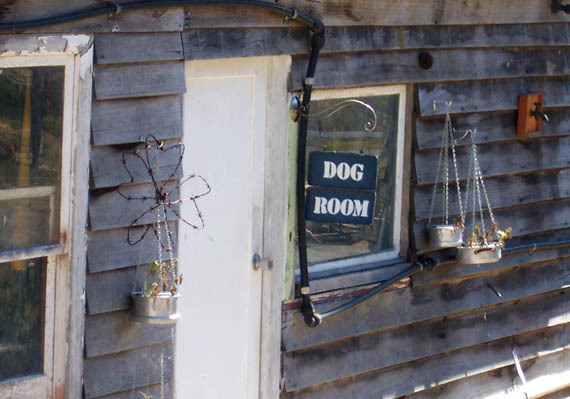 It now hangs off the door frame (the entrance to the hydrobath room with the grooming room to the left) between my dying herbs in colander planters (you may remember them from this post when the herbs were new and still happy to be alive) and the four leaf clover Wayne made me out of rusty barbed wire. This is the view as you drive into our yard. I think people will get it. Don’t you? Especially with the new sign at the gate directing them to look that way. Stay tuned for that sign tomorrow! It looks perfect! I love the tool box idea! 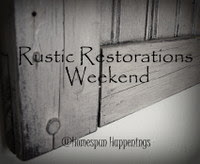 Thank you for sharing in this week's Rustic Restorations Weekend! How cute and clever…love it!! Great use for that toolbox and whatever it is that you used for the pretty hanger!! Congrats on the feature at Beyond the Picket Fence!